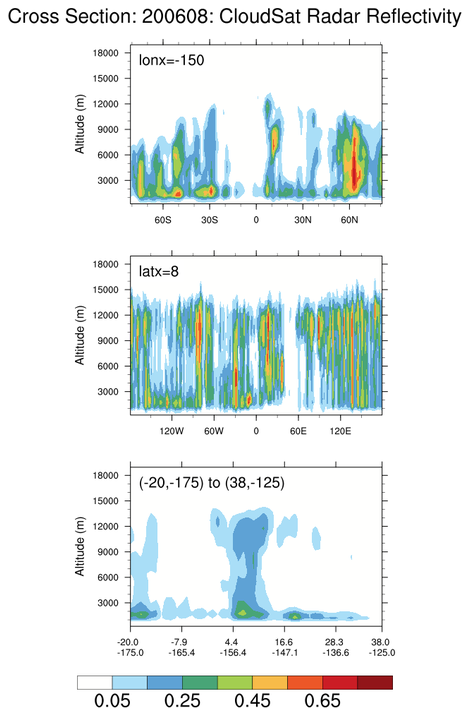 CloudSat is a satellite mission designed to measure the vertical structure of clouds from space. The radar data produces detailed images of cloud structures which will contribute to a better understanding of clouds and climate. 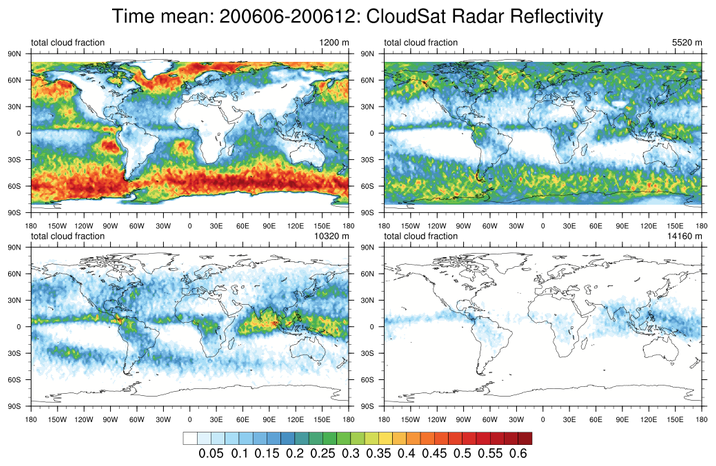 The CFMIP-OBS (Cloud Feedback Model Intercomparison Program) has designed a protocol to evaluate clouds in climate and weather prediction models based on satellite observations. The HDF-Group has created a suite of NCL, Matlab, IDL and Python examples which includes both scripts and the created graphical images. They also provide NCL specific comments. 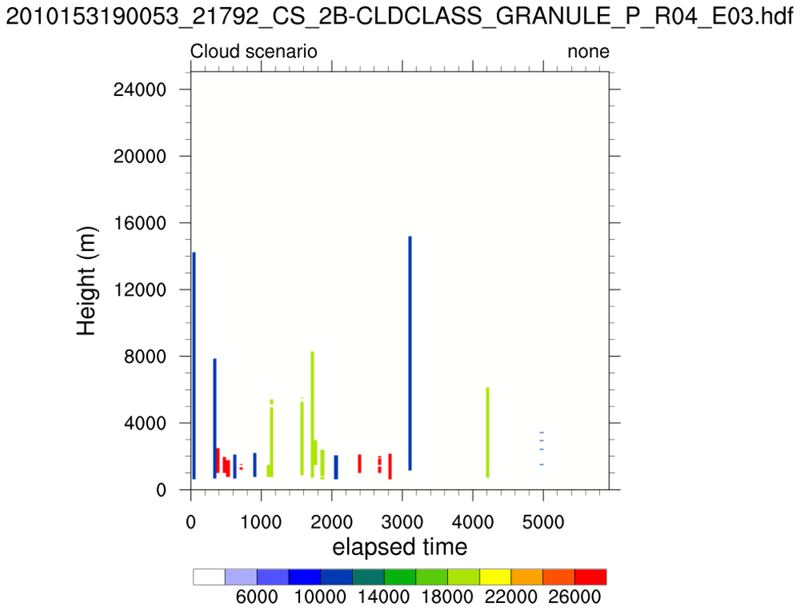 This site is updated so CloudSat examples may be added in the future. Please check. 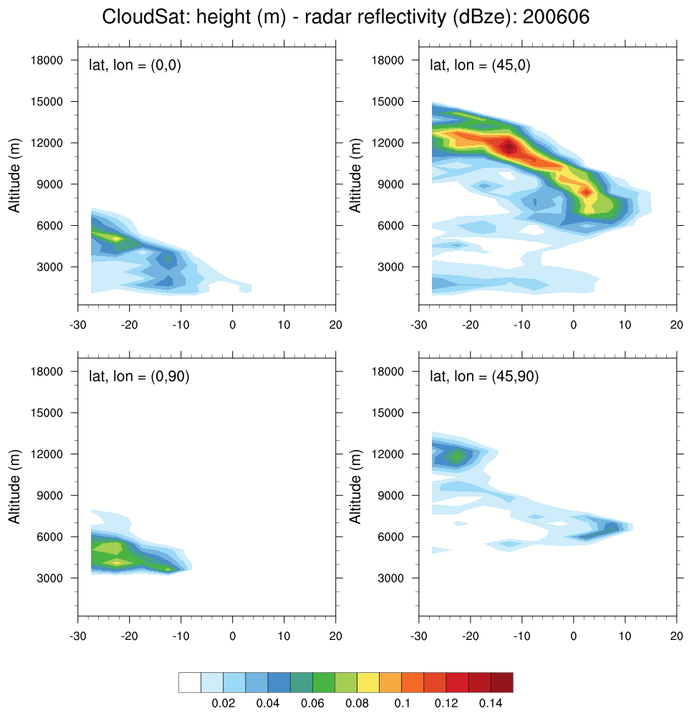 cloudsat_1.ncl: (1) Average "CloudSat Radar Reflectivity" over the period 200606-200612 at user specified levels; (2) Radar reflectivity in the vertical at user specified (lat,lon) locations; (3) User specified cross sections. The last cross section uses linint2_points_Wrap to interpolate to a series of arbitrary points. The gc_latlon is used to generate the points on a great circle path. 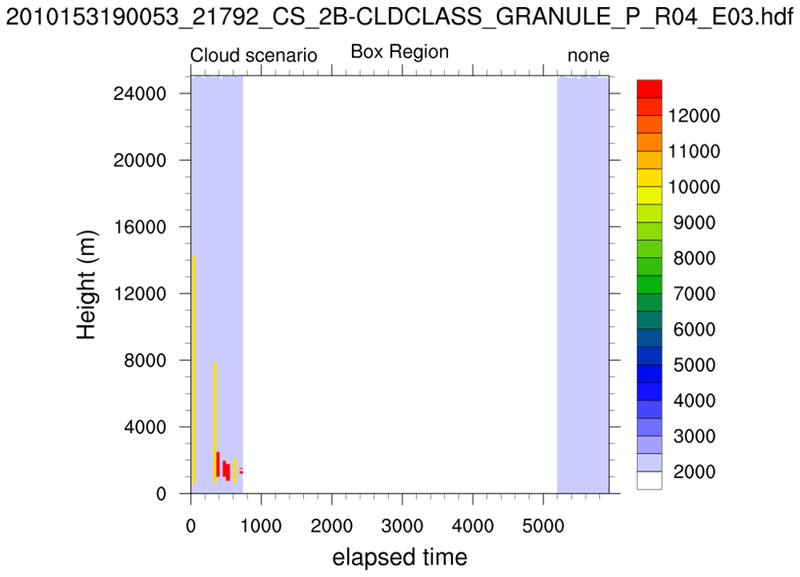 This file is CLOUDSAT 2B-CLDCLASS. 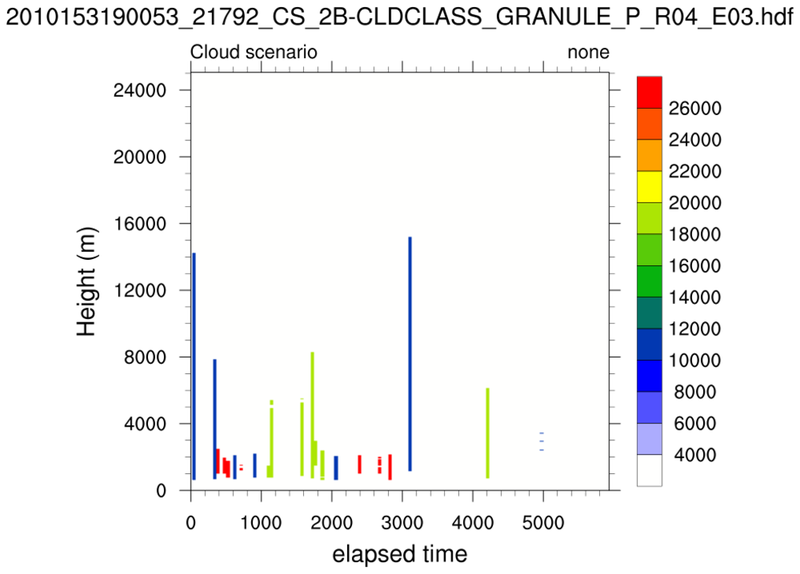 The variable being plotted cloud_scenario is "Algorithm outputs (cloud type and different flags) are combined into a 16 bit cloud_scenario." Hence, the variable is a bit non-sensical to plot directly. However, at the time this plot (and Example 3) was generated, the packing information was not readily available. The ncl_filedump command line operator was used to examine the file prior to use. The generic .hdf extension 'hides' the fact that this is a HDF-EOS file. Further, the file contains a satellite swath (GROUP=SwathStructure). Since this is a HDF-EOS file, the file is read with a ".he2" or ".hdfeos" extension in the addfile function. This tells NCL to read the file with both the standard HDF and HDF-EOS read software. NCL merges the information so user have one unified view of the file. This script reads a variable and plots the entire swath. A color contour map which uses 'white' for smaller values is specified to 'hide' lower values. For 'fun' the figure is replicated to show both horizontal and vertical label bars. See opening statement for Example 2. Same data file as Example 2. Plot the total trajectory. Specify a region of interest and plot an outline of the area. Then plot only data which occurred in the region of interest. Manually specify a finer contour interval. 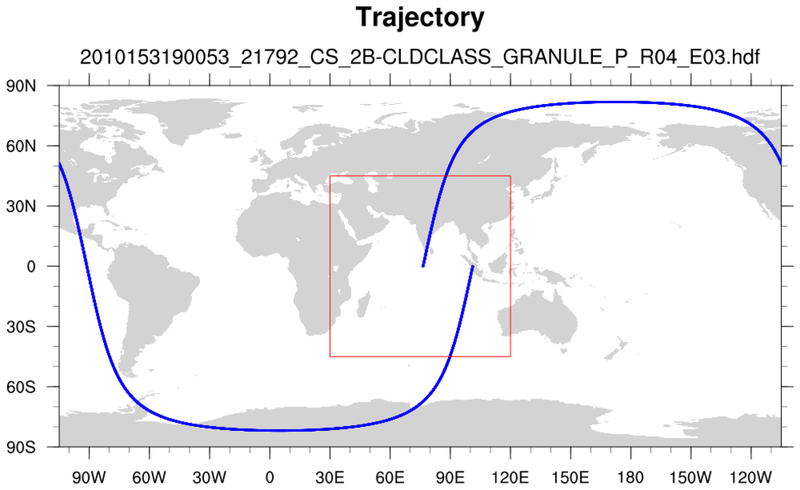 NOTE: The satellite is within the specified region at the beginning and end of the time interval.